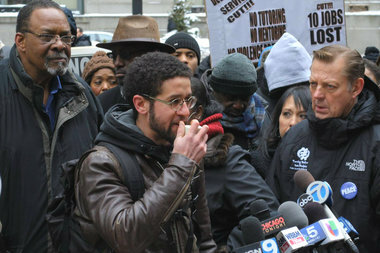 Oscar Rivera Jr. speaks at a rally to restore Illinois budget cuts that cost Bikes 'n' Roses $276,000 in state grant money. ALBANY PARK — Oscar Rivera Jr. was nearly brought to tears watching Gov. Bruce Rauner's State of the State address. "We should create a Minority Enterprise Small Business Investment Program to assist minority entrepreneurs in startups throughout Illinois," the governor said in his speech. "He talks about helping entrepreneurs in low-income neighborhoods. I'm thinking, 'That's me!'" 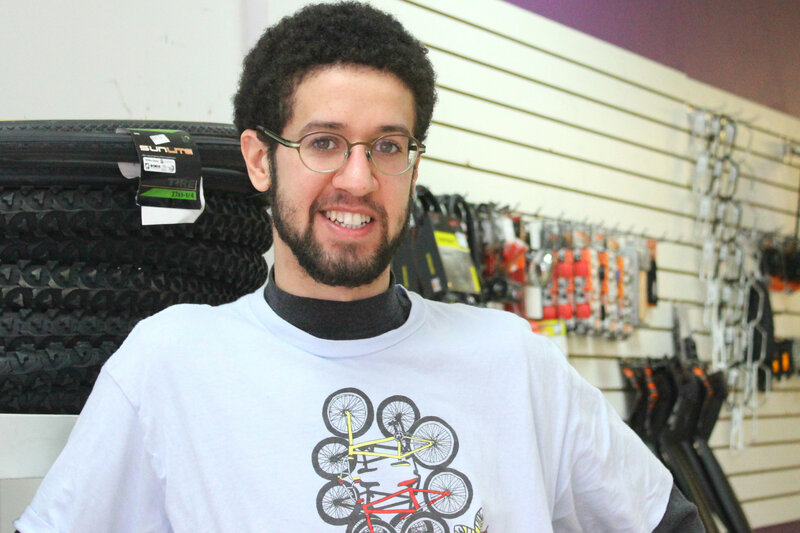 said Rivera, coordinator of Bikes 'n' Roses, a youth job training and employment program that, under Rivera's leadership, has become a bona fide bike shop in Albany Park. "I almost cried," he said. But those weren't tears of joy. The day before his address, Illinois' newly installed governor had frozen millions in grant dollars disbursed by outgoing Gov. Pat Quinn on Jan. 1. Of those millions, Bikes 'n' Roses lost $276,000. "I had just hired kids, I had to fire them," said Rivera. "My value is zero, obviously, to the state of Illinois governor." Over the past two years, Bikes 'n' Roses has gradually been working toward self-sufficiency. Founded in 2011 as an after-school program under the umbrella of the Albany Park Neighborhood Council (now called Communities United), Bikes 'n' Roses had just reached the point where revenue from its repair services and retail sales could cover its expenses. The shop was unexpectedly forced to shutter in October, when it lost its lease on its Kedzie Avenue storefront, the property owner opting to rent the space to Bargains in a Box instead. "We had to shut down through January and every month that went by meant zero revenue," Rivera said. "The shop had been paying for itself. Now I got slapped down to ground zero. How are we going to reopen?" The answer came in the form of a grant from the Illinois Department of Human Services. The funds, which the program applied for jointly with other neighborhood agencies, were earmarked to provide jobs for 85 youth — 30 of them at Bikes 'n' Roses. The money was also enough for Rivera to pay rent and utilities on temporary digs for the next six months until he could get the program back on its feet. Rivera moved forward, hiring, making plans. "I applied for a grant and I got it. They said, 'Go for it.' I went for it," he said. Rivera made job offers to 30 youth, at $9 an hour, 15 hours a week. One of his recruits left a fast-food job for Bikes 'n' Roses, which provides more than a paycheck. "I check their report cards, their attendance. We help with resumes" and hold workshops on topics like how to fill out financial aid forms for college, said Rivera. "They're not getting these kinds of benefits at low-skill low-paying jobs," he said. Then, just days into his administration, Rauner froze the grant funds. "We got an email at 4 o'clock on Jan. 29 that everyone must be fired," Rivera said. "A lot of people got let down, and that's just our organization. The whole state got let down." In an email response to a request for comment from DNAinfo Chicago, the governor's office stated: "Unfortunately, Governor Quinn signed a budget that is unbalanced by $1.5 billion. The administration is taking action to manage the inherited budget hole and is working with the legislature to find responsible solutions." Rivera said he understands the state is in the midst of a financial crisis but questioned the suddenness of the governor's actions. "He's a business man, thinks like a business man. His procedure was completely radical and wrong," said Rivera. "You have the capacity to come up with a better exit plan. I know he's not that dumb." Rivera is now scrambling to plug a budget gap of his own. He headed down to Springfield to plead his case with state representatives and senators, hoping a "pocket of money" could be found. Ald. Deb Mell (33rd) has been working her connections as well, lobbying for the governor to pay a site visit to Bikes 'n' Roses. "This is ridiculous," said Mell. "This is a good example of exactly where you don't want to cut funding." The latest setback has left the usually upbeat Rivera angry and disappointed. "On the train ride home from Springfield, I was on websites to see what jobs are out there," he said. "How long can I allow myself to be forgotten?" But he's not prepared to throw in the towel just yet. "I feel like giving up. Will I? Hell no," Rivera said. Program youth are organizing fundraisers and Rivera had a meeting scheduled with supporters to explore a Kickstarter campaign. His goal is to somehow cobble together the entire $276,000 the grant initially provided, even though all of that total wasn't designated for Bikes 'n' Roses. "It's not just about my youth. I'm shooting for the stars here," he said. "If I just fight for myself, I'm as bad as Rauner." Those interested in donating to Bikes 'N' Roses can do so electronically via the Communities United website. Click the "donate" button on the organization's home page. Or send a check directly to the bike shop at Bikes 'N' Roses, 3448 W. Lawrence Ave., Chicago IL 60625.